Every year, it comes up in mid-science project (meaning, at midnight the night before) that we should have the kids do their annual science fair projects in the summer when we have more time. And the thought leaves as quickly as it came. Summer rolls around and we opt instead for the beach and sleeping late and total laziness. Because it is called summer, right? However, my situation this year caused me to reevaluate. Sometime in the spring, my friend Jennifer and I decided that this would be the year we would make summer science projects happen. She is responsible for facilitating two little scientists, and this year for the first time, we are responsible for three. Three science fair projects. Do y’all get the magnitude of what I was facing? Since in my past experiences, it has taken a minimum of one adult per child to facilitate and make sure actual work is taking place, and since there is no guarantee that Nathan will even be in town in the weeks leading up to said science fair, and since no one has volunteered to adopt one of my three kids for a few weeks to manage their project and bring our responsibilities back down to a more reasonable “one adult per child” ratio, I knew I had to have a new and elaborate plan this year. And there is basically no one in the world other than Jennifer that could plan and implement with me the type of logistics, schedule, and sheer craziness that would need to happen. So we decided to pool our combined nine years of science fair project management and overall mommy awesomeness to create a plan. We looked at both of our calendars and figured out when we could do this. We got right on looking for an idea for all three girls. By June 1, the girls were doing their experiment. Take a moment to take this in, my friend. June 1. School wasn’t even out yet as we started an assignment for the next year. Be amazed please. For the next six weeks, they measured their hair and our hair and did various hair treatments and recorded data. It was a lot of trouble, and we managed to do this junk even while on vacations. This was all timed to be completed by July 13 because…….wait for it……July 14 is when we started our week-long Science Fair Camp. That’s right. We set aside this week to come together for a half-day each day and knock these five projects out all in one big swoop. 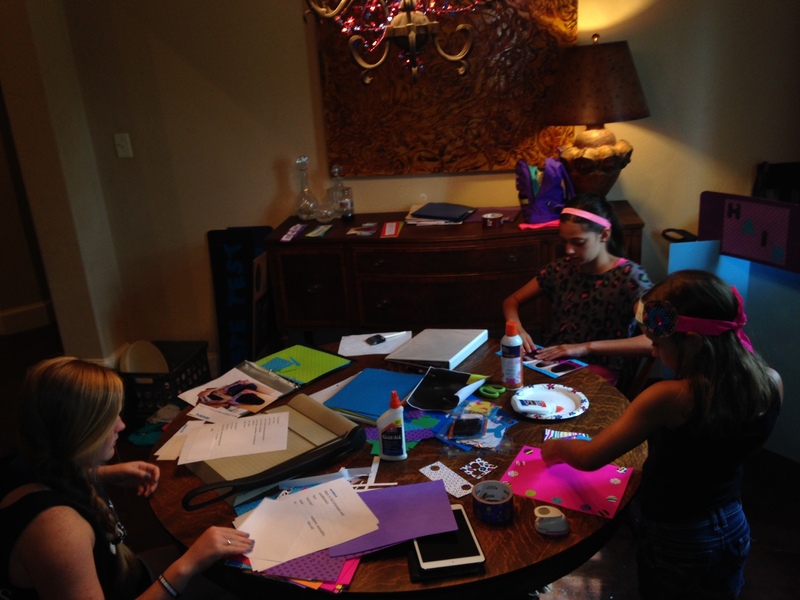 So on Monday July 14, we came together at Jennifer’s house armed with five display boards in the colors the kids had chosen, printed card stock, colored paper, glue sticks and bottles, scissors, a paper cutter, an Ipad, two laptops and a desktop. And also cheese balls, Capri Suns and cookies, because these things are very important. As I pulled up to Jennifer’s house and started unloading my ridiculous assortment of supplies, she said, “Are we sure we want to do this?” We practiced repeating “It will be worth it. It will be worth it.” But in reality, neither of us knew if this would be the best idea ever or a huge disaster. My kids were actually a little excited. I had done my best to build this up, which was hard to do sincerely because I really had no idea how great it would be. But they were surely more excited about science projects than they ever had been before. The boys had an idea but had not yet started their experiment. So Jen took supervision of the boys in the kitchen as they got going whipping up a tasting experiment while I got the girls organized planning the color schemes of their boards. We found that having all the supplies right there together and having them working on the same thing, like preparing the titles for the board, really streamlined the process. What didn’t streamline the process was if we left the room for thirty seconds to share an interesting personal story with each other. Nope. That resulted in a cheese ball fight. As in, throwing cheese balls at each other and them landing all over the floor. Sigh. Also, let me be clear, they worked at the same time but did not make decisions together. No one chose the same way to do their letters, colors or fonts. And even though we only had two different experiments total, they each individually were typing up their thoughts and analyzing their data to make it their very own. While Jennifer took the boys driving around to do their experiment, the girls all got busy typing up info for their boards and notebooks. We finished the day with all experiments done, titles for the boards finished, and with the girls started on their notebooks. And Jennifer and I both stood in amazement that it seemed this was gonna work! The girls hard at work on Day 1. And working not as hard. Before the day ended, however, I checked at home and discovered that I only bought four project boards instead of five. Nathan stepped in and took Abby to Walmart to hopefully find a board. 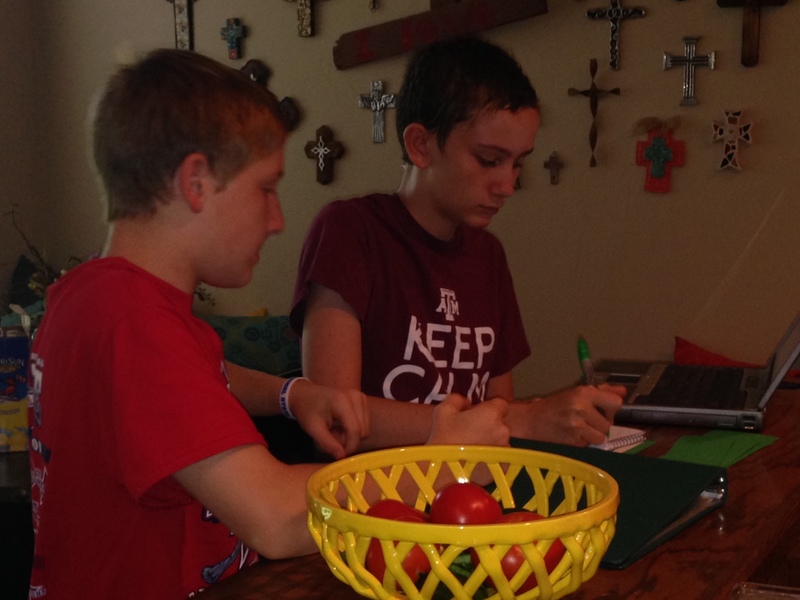 We HAD to have the board to make science camp work, and I did NOT want to drive to Tyler before science camp the next morning. But Walmart didn’t have even a plain board in the right size. This was going to complicate things but not make it impossible. And also Jennifer did go to bed with a migraine, but is any of this really shocking? I mean, really, we’re talking science fair projects here. 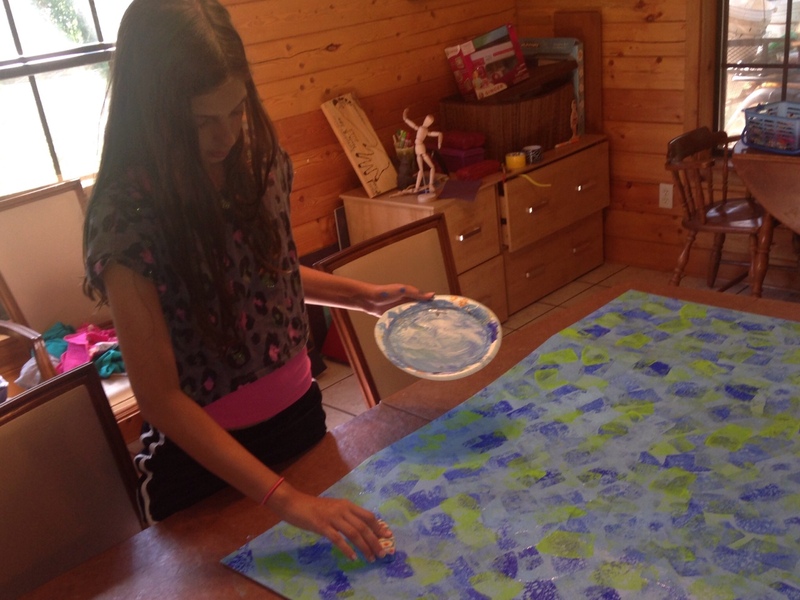 Abby began preparing stuff for her board and looking at the size of the other boards to figure where she would arrange things since she didn’t have her board yet. Lots of progress happened, but there were a few holdups and things that slowed us down. We brought two computers from my house but were never able to make them work with the printer. So this delayed things for Sam and Lydia. We also found that the glue sticks worked the best for sticking things onto the board quickly and smoothly. But it would take like four glue sticks per person, and we had only scrambled up three total. The other kind of glue wasn’t producing the neatest results, but it worked. About two hours into this second day, Jennifer’s little scientists were done. As in, missing some pictures that needed to be printed, but totally finished other than that. Lydia was close to finished as well. This threw us off. Science camp was supposed to go a half-day for four days. Friday was reserved as a fun celebration day, or a day to add extra time if needed. We hadn’t considered that by day two, people would be finished. What? Our idea had worked too well it seemed. Because it was only my kiddos that were still working, we decided that we would do our own science camp just for my kids at my house the next day, and then come back together for fun celebration Thursday or Friday. Boys going over their data on Day 2. They were bummed. They wanted to be with their friends like on the other days and any remaining enthusiasm was gone. We started at the designated time and tried to keep the schedule and everyone got to work. The work seemed slower and it was easier to get distracted. It was also easier for me to get distracted with another task and not stay in “science project” mode. All that slowed things down. We also found that when it was just my crew, the scientists got more whiny, and the mommy wasn’t as nice. But somehow despite these things, after three hours, Lydia and Sam were both done. Abby’s work was the slowest, because this was the first day she actually had her display board and because she worked more art into her project, which added time. And when the other two finished, they did things that distracted Abby and made it harder for her to stay focused. It was much more tempting to give up for the day and put things off. But I refused to let that happen, and after five hours or so, we had all of them complete. Five science fair projects, not due for several months, all finished. Abby giving her project board a little extra flair on Day 3. This sweet girl made us a cake for Day 3. But since we didn’t meet together, they ate it without us because that’s the kind of friends they are. Science camp is the best idea ever. We are geniuses. Basically, end of story. But here’s a few more things anyway. We need more glue sticks. Next year, tons of glue sticks. Getting every device to recognize the printer is a must. Which means I will have to ask my husband to help. No child left behind. 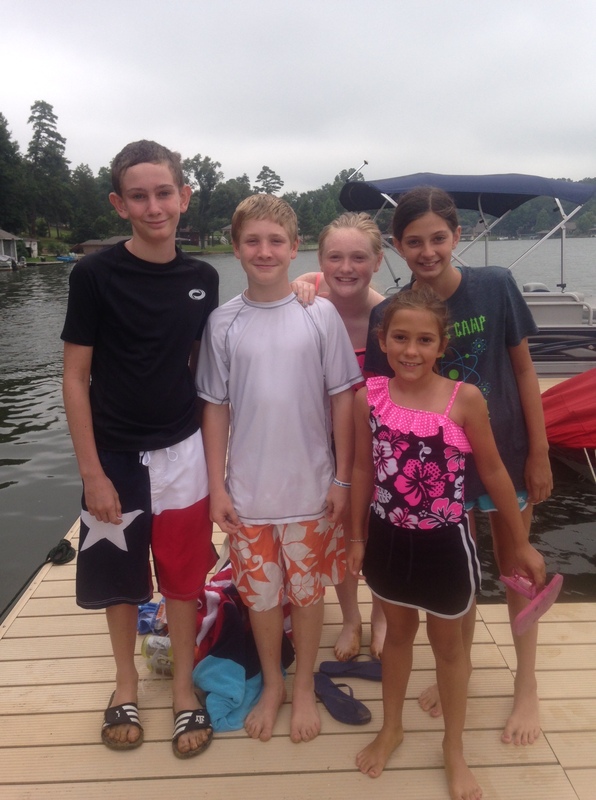 Next time, science camp stays together until the last project is finished. We will cheer on, encourage and support our friends and siblings. We’re all in this together. Blocking off the time made all the difference. It kept us from distractions or procrastination. And because each family was expecting and counting on the other to be there, we weren’t tempted to postpone or bail. These happy campers finished the week all smiles. The week turned out surprisingly well but nothing like we had expected. In keeping with that theme, it was 70 degrees at the end of the week. In Texas. In July. 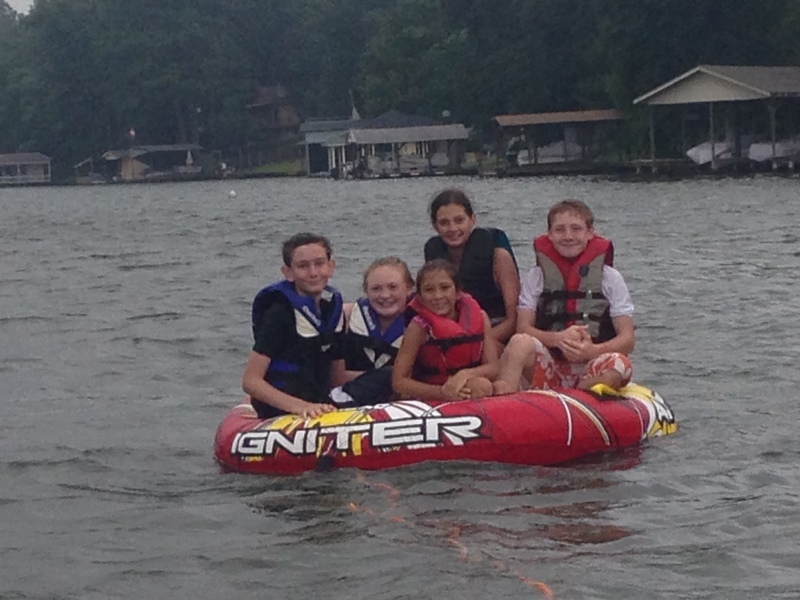 So our end-of-camp tubing on the lake celebration didn’t seem as fabulous an idea as it did before. Everyone was finished with their projects by Thursday, but it was below 70 and rainy that day. Friday it was clear but still about 70 degrees. But we were all determined to celebrate our accomplishment and end our week with a bang, so we took the five scientists tubing. And we brought along hot chocolate to warm their shivers. 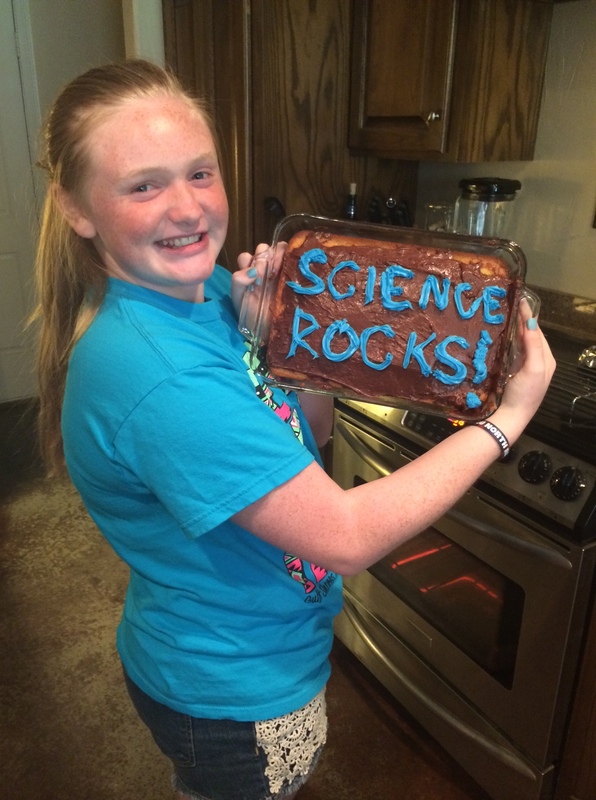 It was the perfect quirky celebration to the end of Science Camp 2014. A cold but super fun celebration on the lake. Can you steal this idea? I totally think you should! Plan your own science camp. And if you don’t, just know that in a few months when you post on Facebook about the misery you’re experiencing over science fair projects, I will be commenting “WE DID OURS IN THE SUMMER.” And feel free to imagine my sing-songy, braggadocios tone if you read those words. I will feel your pain, but I will just not be able to help myself. We were running out of project storage space. 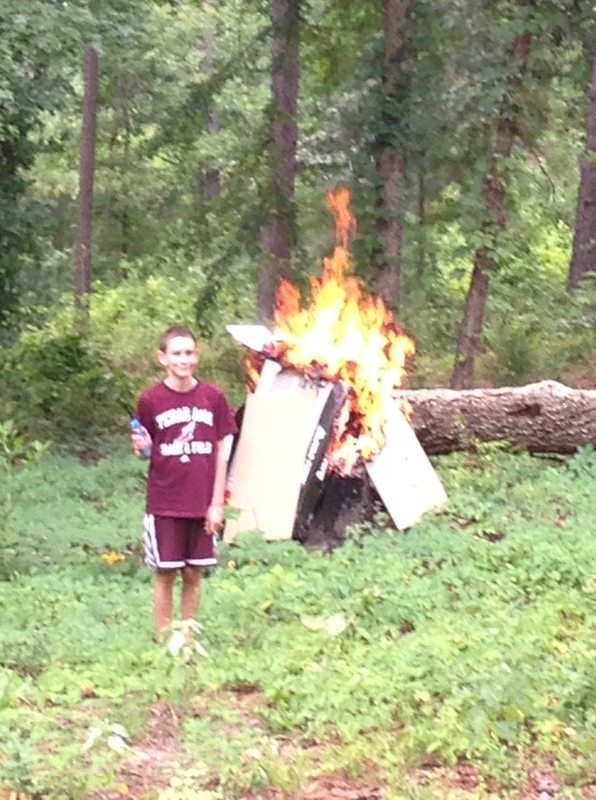 So Sam enjoyed burning all the past project boards. And also this will keep me from selling them online which has been very tempting. I love the awesomeness and creativity of you two!!! In addition to the science lessons, y’all have created wonderful memories! 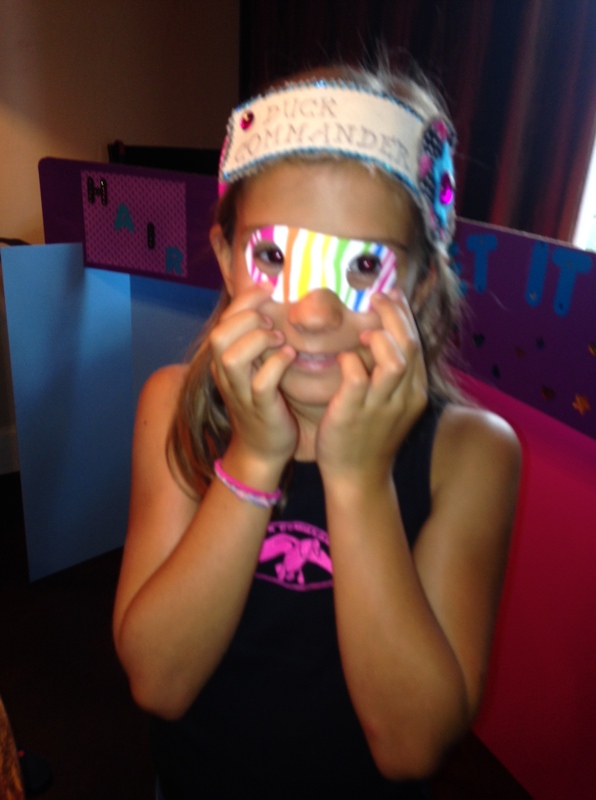 Thank you for being willing to facilitate this with your kids! I can’t wait to see the projects!!! Loved it. You are so creative and have wonderful communication skills. Not sure why but this reminds me of the time that Paul and I had to wallpaper the dining room. We were dreading the work as well as the “working together” because we do things so differently. He doesn’t usually do things my way, the right way. So our best friends showed up at our door with wallpapering supplies in hand and smiles on their faces. Suddenly the dreaded task became fun and we finished in one night, friendships and marriages unscathed. The next day I skipped around my kitchen singing “done! done! done! the dreaded task is done!” So….good for you and Jennifer! Hardy pats on the back are definitely in order. And, I think the night before the projects are due you should all meet together again to go get ice cream, watch a movie, etc. Just because you can!